Conveniently Located Laundry Facilities on each floor & 4000 feet of Private, Sugar-White Beach Front Property. Our Resort is next door to the nationally-ranked Kiva Dunes Golf Course. Perfectly situated, the Plantation is minutes away from the restaurants, shopping, and entertainment of Gulf Shores, yet you are away from the over-developed crowded beaches of the strip. This Gulf-front, Non-Smoking Condo is fully furnished and well maintained for your comfort. Kitchen was updated with granite countertops and is equipped with all new stainless steel appliances to include refrigerator, stove, dishwasher, microwave, blender, coffee maker, and toaster. Condo also has two TV's (49 &43"), Smart TV Funtions including Netflix, DVD, Cable and a CD/music player and Iheart Radio. Bedroom has a comfortable foam queen-size bed and living room has a foam sofa sleeper (also SmnartTV). Unit also has two built-in bunk beds recommended for children only. Linens, iron, and all kitchen utensils provided. Facility offers a coin operated laundry just steps away. Be careful as not all Plantation condos have access to an indoor and or the outdoor heated pool and some condos charge $20 for parking. Yes, this condo has access to both those pools and we have free parking. Beaches were always our passion. We couldn't wait to travel to new tropical settings. The tranquility and beauty always puts us in proper perspective of appreciation for the gifts of nature. After the first trip to Gulf Shores Alabama, we knew it was a place we wanted to return again and again. We've love visiting by ourselves, with our family (10 grandchildren) and friends. The beach never disappoints us. This Condo has a Beautiful Beach Front View. On site: 6 Outdoor Pools 1 heated, 1 Indoor heated Pool, 4 Lighted Tennis Courts, Lighted Basketball Court, Shuffleboard, Horse-shoe Pits, Hot Tubs, Steam Room, Sauna, Game Rooms Exercise rooms and a Board-Walk to the beautiful beach Movie Rentals, Connections, Central Air, Refrigerator with ice maker, Cooking Utensils & Linens provided, Coin operated Laundry Facility in complex Nearby:Charter Fishing, Tanger Outlet Mall, Fort Morgan, Bon Secour National Wildlife Refuge, Spa/Salons, Water Parks, Ferry to Dauphin Island. This was everything that was advertised and more. The view was very nice and the chairs in the balcony were very comfortable. We spent every morning having coffee and watching the ocean. This condo was very clean and maintained. The shower had good pressure and soft water. We spent hours down on the beach and it was the best sand and privacy that I have ever had. The only problem was we had to leave too soon and should have booked a couple of weeks. Thank you for renting us your place, it was wonderful. Just returned from a girl's trip with a life-long friend and stayed at Gary & Laura's condo. We have nothing but good things to share in terms of our experience. The welcome packet we received from Gary and Laura shortly after booking, was thorough and provided all of the insight that we needed for our stay. The condo is clean, well maintained, and fully stocked with everything one needs for a comfortable stay. Oh - and one may wonder about the view and the beach? BEAUTIFUL! Amenities on the grounds were plentiful. While we didn't use any amenities other than the beach, we did walk the grounds and took a look at the the activities and amenities available for guests. Everything looked well maintained. During our stay we visited Tacky Jacks (Fort Morgan) and had delicious Grouper fish tacos. We also took a day trip to Gulf State Park to do a bit of biking. The time we spent in Gulf Shores, felt like a trip to the big city in comparison to the condo in Fort Morgan. There was something about making that turn off of HWY 59 and heading west on HWY 180 that soothed the soul. The winding road, the green vegetation, the bay on one side of the road, the gulf on the other.... There is no doubt, we'll return again. Condo was very clean, and well stocked. Beautiful view of the natural dunes. I would definitely reserve this condo again. The owners were very easy to work with. It’s in a great location, away from the hustle of gulf shores, yet close enough to go every night for seafood. We were so glad you enjoyed our condo. We also love that view...even if we stay in and just walk across the way to get some Sassy Bass, we feel like with on vacation. Hope to hear from you again. Beautiful views, well kept, nice people, and phenomenal fishing. The bunk beds are on the small side but work just fine for young children. Owners are responsive. Michael, Thank you for the review. We are so glad your visit was a positive experience and you got to enjoy the beach. Hope to hear from you again. Well maintained and partially updated. Fully equipped. Enjoyed the quiet area. Beach view wonderful. 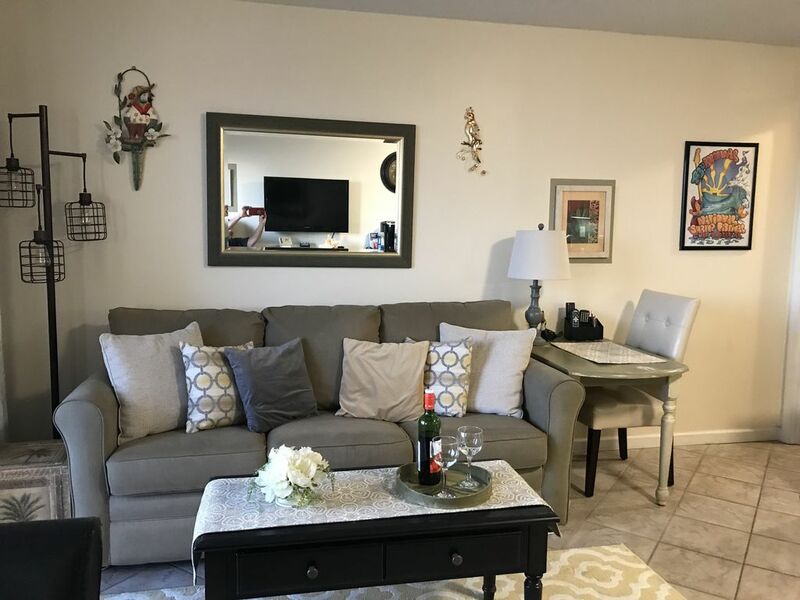 Beautifully appointed condo with an amazing view of the gulf, sand, and surf......would highly recommend to family and friends......You'll find everything you need and more at your fingertips......thank you for sharing your home away from home! P.S. Loved the bedroom mattress! We are so glad to hear you enjoyed our condo. Your kind word are very appreciated. We were happy to share our beach get away with you - hope to hear from you again. Nearby:Charter Fishing, Tanger Outlet Mall, Fort Morgan, Bon Secour National Wildlife Refuge, Spa/Salons, Water Parks, Ferry to Dauphin Island. Quotes and secured booking are for designated persons as shown on reservation at time of booking. Any additional persons must be approved prior to stay and additional charges may apply. Units maximum capacity is 6.